Every year, the Bureau of Labor Statistics tells us what the typical American spends on everything from his rent to his reading material. There's just one problem. In a country with growing income inequality, the typical American leaves out a lot of Americans. For example, the poorest quintile of Americans spends about $22,000 each year. The richest spends about $100,000 each year. (The richest 1 percent spends hundreds of thousands of dollars each year.) 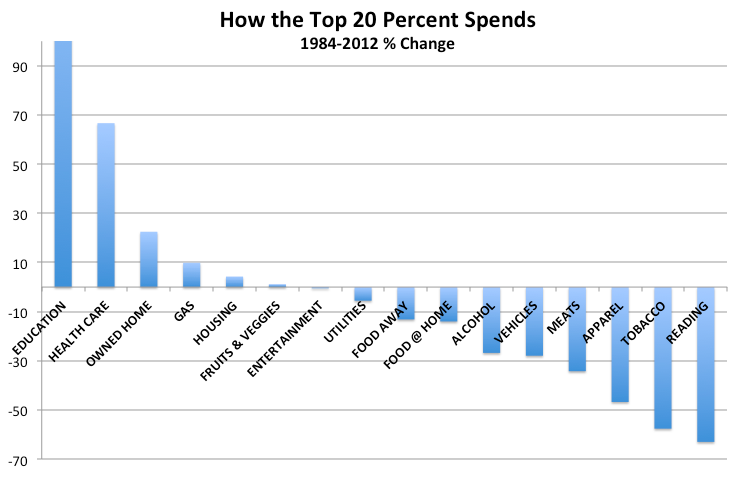 So to understand how Americans really spend our money, it helps to break us down into groups. And, since the BLS has been producing this spending survey for nearly 30 years, it's even more helpful to track those groups over time to see how the American budget is changing. So let's do that. If you want to play along: 1984 survey is here and 2012 survey (the latest available) is here. The biggest difference between the lowest- and highest-earning Americans is what they spend on housing. Less than 40 percent of the bottom quintile owns a home, compared with 90 percent of Americans at the top. As a result, the top quintile outspends the bottom on housing by $21,000 a year (remember: that gap alone is basically the entire budget of a lower-income family) and $13,000 more on transportation. At just about every income level, we spend about half our income on living and getting around. 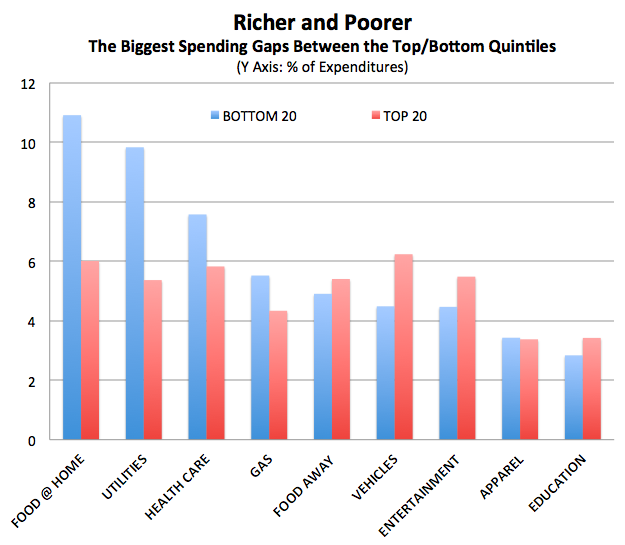 But after houses and transportation, what are the biggest spending gaps between the top and bottom quintiles today? The poor spend nearly twice as much (as a share of their budget) on food at home and utilities; the rich spend more on entertainment and education. Reaching back to 1984, education spending has nearly doubled as a share of the richest quintile's budget. Health care spending and housing has also grown. By contrast, the portion of spending dedicated to things like reading, smoking, and clothes has declined rather significantly. For the lowest-earning group, which includes both seniors on a pension and low-wage workers, rent has nearly doubled as a share of the budget. In 1984, somebody in the poorest quintile of the country spent $3,800 on housing—and $67 on books, newspapers, and other reading material. In 2012, they spent $8,800 on housing—and $44 on reading. Once again, clothes and reading have gotten cheap for everybody—the former because of apparel manufacturing's globalization; the latter, because the Internet.